White peas dried / sukha matar/ Matra- No onions no garlic recipe! Light and delicious matra served with warm kulchas is replicated at home!Matar kulcha is one of the popular street food of Delhi. Clean, wash and soak the matar / dried white peas overnight. Put soaked matar / dried white peas in the pressure cooker with 4 cups of water on high flame, the moment pressure is formed, reduce the heat to low flame for fifteen minutes. Let the pressure cooker cool to room temperature, open the lid and take out the cooked peas in a bowl and keep aside. Grind all the ingredients, cumin seeds, fennel seeds/saunf, fresh mint leaves, of asafetida/hing, cardamom, seeds , dry mango powder/amchur powder, red chili, black salt / kala namak, black pepper powder, and tamarind with water to a smooth paste. keep aside. In a pan, heat oil. On a high flame, add the cumin seeds, when it starts crackling remove the pan from stove. Add the dry spices like chaat masala, roasted cumin powder, amchur powder and red chili powder. Stir and add the cooked matar to these masalas. Place the pan on the stove and heat the matar for 5 minutes, add the prepared masala chutney and mix well. Cook the matar or peas curry till masala is well blended, for about 2 minutes. Serve hot the matar garnished with coriander leaves,onions, tomato, ginger and chilies squeeze some lemon juice on top and mix lightly with Kulcha. Although dried peas belong to the same family of beans and legumes, they are classified in a separate group due to the preparation. The fully matured pea pods are dried to get dried peas. It is harder and starchier than that of fresh peas and can be readily used when fresh peas are not available. 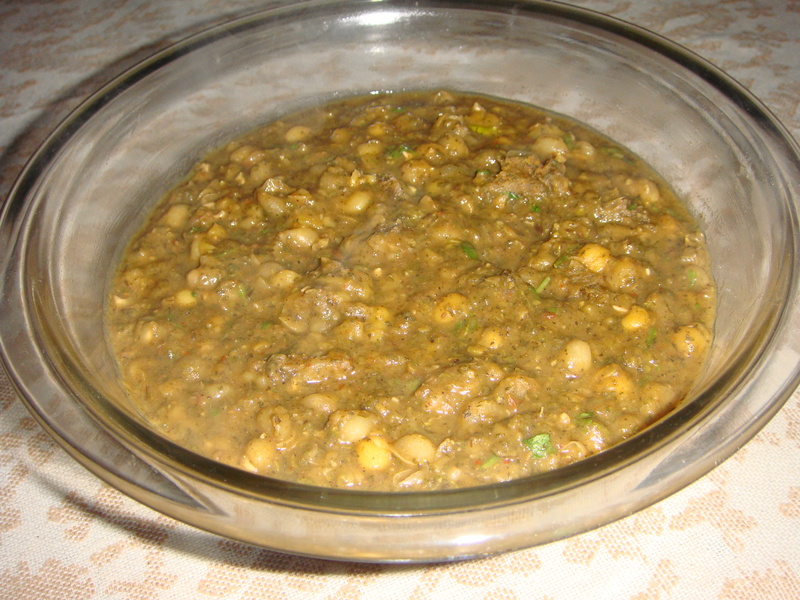 Dried peas are available in yellow, green, and red colors. Health benefits of dried peas are numerous due to their nutritional value. Dried peas benefits are numerous owing to the presence of essential vitamins, minerals, and other nutrients. Since dried peas have high fiber content, they have a cholesterol lowering effect. People with diabetes, hypoglycemia, or insulin resistance problems suffer from irregular glucose metabolism. Dried peas helps to maintain blood sugar levels as it slows down the burning process, thereby providing steady amounts of glucose to the blood. A cup of dried peas provide 65.1% of the daily value of fiber, and the fiber helps to relieve constipation and prevent gastrointestinal disorders. The isoflavones present in dried peas prevents health conditions like prostate and breast cancer. Dried peas are good sources of iron and by eating a quarter cup of peas daily, one can meet 8% of his/her daily iron needs. Other dried peas benefits include the lowering risk of heart disease. The ingredients folate and magnesium present in dried peas help to maintain the level of homocysteine and help to avert heart diseases. Dried peas are rich in magnesium and potassium. The former helps to improve blood flow, and the latter helps to maintain blood pressure, thus lowering the chance of plaque buildup in blood vessels. Sulfites that are commonly used in salads and processed foods cause headache and disorientation. Molybdenum present in dried peas play a vital role in detoxification of sulfites. One can obtain 196% of the daily value of molybdenum by consuming a cup of cooked dried peas. Dried peas are also great protein snack with fiber that helps with weight loss. They will curb hunger pangs by keeping the blood sugar levels under control.